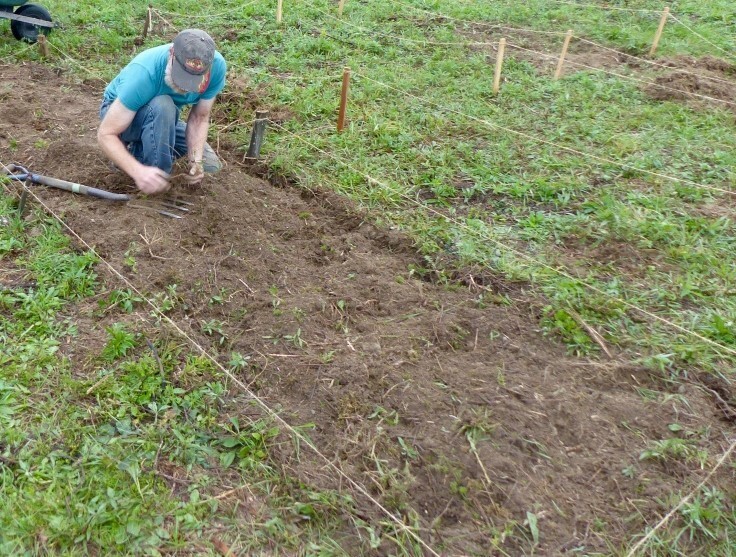 Since EcoVillage Ithaca (EVI) was established 25 years ago on our 175-acre property, one of our constant concerns has been the proper stewardship of our land. Our desire to live in closely connected neighborhoods enabled us to plan the construction of our dwellings so that 100 homes could be built on only 15 acres. Developing suitable agriculture has also been a high priority, with an organic community-supported-agriculture (CSA) vegetable and fruit farm, an organic CSA berry farm, a training ground for new farmers called Groundswell, and community garden plots for all families. Wooded areas have been selectively culled and then enhanced by the planting of appropriate trees. In recent months, a new venture—a plant nursery—has emerged. Bradford wanted to take some steps in this direction: to start with a small space, learn the techniques, get experience, let others from EVI and outside the village see what we are doing, and then steadily gauge what and how we would like to expand these processes. 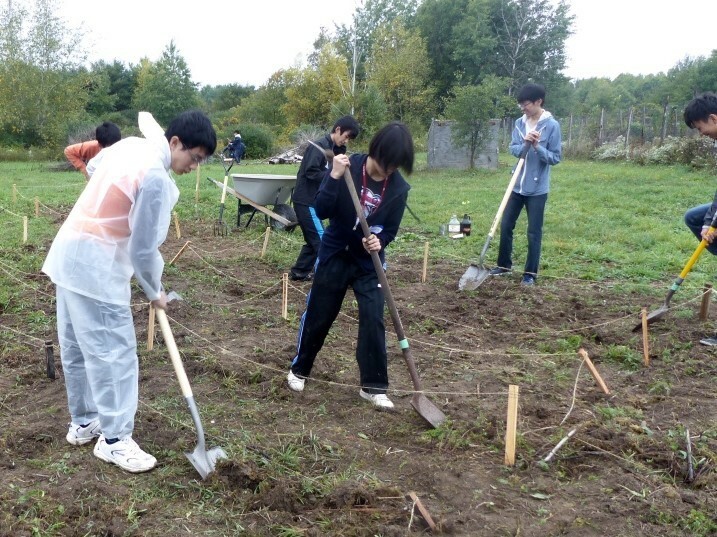 Because of ongoing concerns of village residents about invasive species, the focus was to be on propagating native plants, trees, and shrubs. The plants could be food producing as well as ornamental. The overall design was meant to encourage the creation of permanent renewable food sources at EVI, and to model the complete cycle of restoration agriculture on site. This idea was met with great interest and enthusiasm. Many residents could see how such an enterprise could assist them with their current and future needs. The idea was presented to EVI’s Village Association board and Built Environment committee and got the approval of both. Residents and local experts like Akiva Silver, whose nursery has grown ten thousand seedlings this past year, who have expertise in permaculture and other appropriate disciplines, were happy to contribute their perspectives and skills for the initial design. After exploring different sites for the nursery, participants chose a location near the existing garden area of SoNG residents. This site has good sunlight, is sheltered from the wind, and is easily accessible from residences. A small road could be developed for truck access. It is close to a shed that was formerly used to house sheep and could be used for storage, and to a “chicken run” that could supply manure for fertilizer. The land is relatively level, but amenable to the construction of swales and berms that could be constructed to catch surface water, an important consideration. As Sean Dembrosky, the owner of a productive local nursery who contributed his expertise and uses many restorative-agriculture processes, pointed out, his whole nursery was able to thrive during the recent 2016 drought exclusively on rain water. Several early work parties were held this past summer. Plans to move ahead with the project then dovetailed nicely with the plans of a group of high school students from Japan visiting EVI for a weekend in early October. They were eager to learn about the different facets of life in a community such as ours. Offered the opportunity to learn firsthand about the agricultural practices favored here, they agreed to work with Bradford and others in building the 30’ x 30’ bed. We will keep you informed as the process proceeds! Visiting Japanese high school students at work building the nursery bed. EVI resident removes some roots.